Four in the morning, mid-December, and snow is smothering St Andrews. Student Alex Gilbey and his three best friends are staggering home from a party when they stumble upon the body of a young woman. Rosie Duff has been raped, stabbed and left for dead in the ancient Pictish cemetery. And the only suspects are the four young students stained with her blood. Twenty-five years later, Fife police mount a cold case review. Among the unsolved murders they’re examining is that of Rosie Duff. But someone else has their own idea of how justice should be done. One of the original quartet dies in a suspicious house fire. Soon after, a second is killed in what looks like a burglary gone sour. But Alex fears the worst. Someone is taking revenge for Rosie Duff. He has to find out who it is before he becomes the next victim. And it might just save his life if he can uncover who really killed Rosie all those years ago. The plotting is impeccable, the atmosphere palpable, and I doubt that it will be surpassed this year. 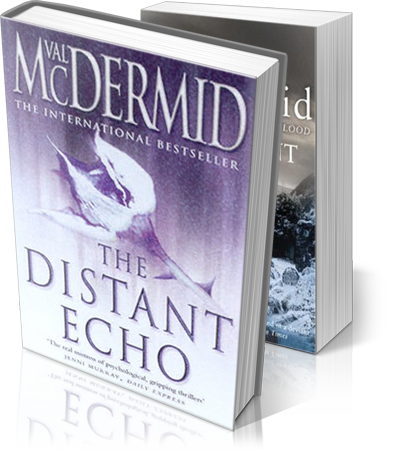 Val McDermid is going from strength to strength… the way she dances effortlessly between so many important characters and switches between events in 1978 and others in 2003 is a delight to observe and read… [There is] mounting suspense as the novel reaches its ingenious climax. A real page-turner and another McDermid triumph. Without flinching from the pain inflicted on murder victims and their families, or any of the manifold sorts of misery human beings can visit on each other, Val McDermid has used the crime genre to write a novel that, above everything else, celebrates life and loyalty. A powerful story of murder and revenge … in McDermid’s hands it becomes and exciting page-turner. Cunningly plotted narrative… McDermid administers the venom drop by drop… the characters are sensitively drawn. Another cracker from McDermid… a substantial and riveting read… There’s no doubting the sheer quality of the storytelling, and the thrill that McDermid delivers.